I realized early during my 1986/1987 flood of recollections that the time-space warp during most of my so-called UFO encounters was controlled by who I call “the mysterious intelligence.” The time/space warps occurred in the immediate local areas…in various unsymmetrical volumes of yards, feet and inches…sometimes here and there, but obviously in patterns where we could clearly see them. While some of us saw and participated, within and out of the volumes, others just sat or stood frozen or went on their way not noticing the bizarre activity…all which was solidly related somehow to at least our normal three dimensional time/space. Sometimes we seemed to be captivated by some invisible force, but at other times we could move freely. … and there’s more. When my relatives and I were at the city square in Santa Fe, New Mexico, I believe during the summer of 1951, others and I saw this happen all day…including at our motel, in various places in the city, and at a campground just northeast of Santa Fe. During one period that lasted an hour or more, the entire square was consumed with fog as disc-shaped craft hovered above it. Strangers also saw some of what we saw. I heard people on the sidewalks near the stores that were near the square talk about it. Then later, while visiting the Indians who were selling their art just north of the square, the small booth developed in the middle of the northwest street intersection. Even though it seemed strange, my cousins and I sat inside the small booth while my aunt took at least two photos. One of the photos was of the booth while it was manifesting from fog (it looked square but like fog). Another photo was of my cousins and me waving from inside the booth. She might have taken more good photos, but I know she tried to take at least two more, but her camera malfunctioned. She then realized the booth was very strange and insisted my cousins and I get out of it. The Indians then suddenly gathered all of their jewelry and began leaving. My uncle asked one of them why and the Indian said it was because they thought I was attracting the spirits and they didn’t know if they were good or evil. My uncle grabbed me by an arm and began pulling me away from the square very forcefully. I asked him why and he told me about his conversation with the Indian. We later were not allowed to enter one of the Indian museums for the same reason. 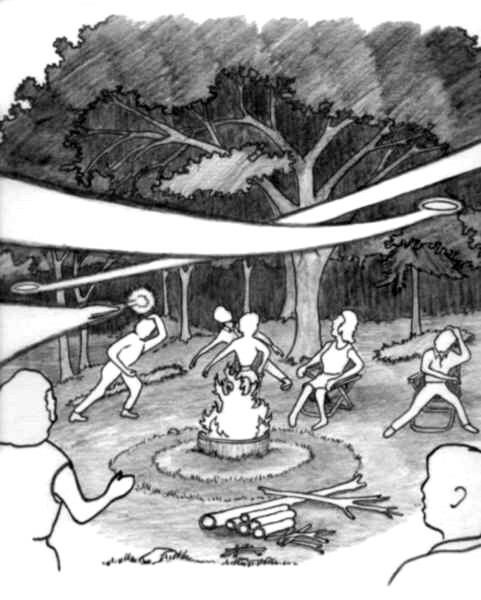 …and we experienced many more UFO encounters that day and later that evening at the campground northeast of Santa Fe. My uncle began to give me trouble because of mysterious manifestations of the strange UFO craft.. The next morning he was bombarded by several large craft that lined up, then decreased in size and swooped in to a foot or so over his head, where they exploded like dynamite. They then reappeared, got in line again as if they wanted another shot at him, and again swooped over his head and exploded, etc. I could write an entire book about that day in Santa Fe. It is more than interesting that my wife and I saw two of the photos two-and-a-half decades later before my mysterious 1986/1987 recollections. My aunt said she didn’t know what the booth was and asked me if I wanted the photos. She wanted to get rid of them because she was going to clean out all photos in her family photo collection. When I looked at them closely, I got deeply depress and told her I didn’t want them. I’ve since tried to find out if her children have them, but apparently she destroyed them shortly after I told her I didn’t want them. My wife doesn’t recall looking at the photos.